Welcome to Cape & Islands Signs! Cape & Islands Signs is a full-service sign shop offering carved signs, Internally lit signs, all types of wood, plastic and metal signs, dimensional letters, restaurant menu signs, large format printing, magnetic signs, interior signs and banners. We specialize in truck and fleet lettering, with three large heated bays at our facility. Please take a moment to view some samples from the categories to the left. To meet the needs of our clients, we are offering top quality workmanship at the most reasonable prices on Cape Cod. Our goal is to maintain a loyal client base through fairness, honesty and fast service. 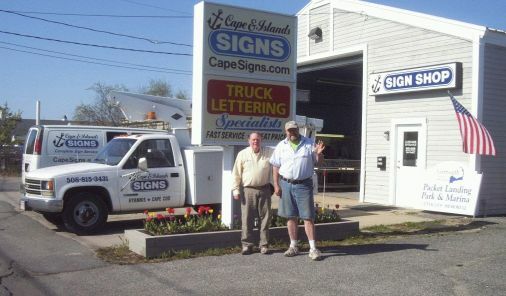 Cape & Islands Signs was opened in 2009 by Chic Pollock, former owner of Classic Signs and Pete Jordan, former owner of Jordan Sign Company. 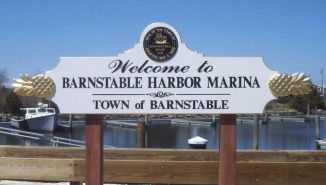 Together we have over 75 years of experience in making signs for Cape Cod businesses. Visit us at our shop at 103 Enterprise Road in Hyannis, Located adjacent to the Cape Cod Mall, we're easy to find. Turn on to Enterprise Road from the lights at Route 132, and we're in the second building on the right (across from Michael's Crafts).